Traveling soon and wondering “do I need a visa to go to China? The answer is yes, almost everyone needs a visa to enter in and travel within mainland China. Unless the person is from the three Countries mentioned below, and needs to stay only for 15 days or less, a person would have to possess visa in order to go to China. Over the years, China has grown to become one of the most sought-after countries to visit by most people. Its booming economy and the country’s march towards a more welcoming attitude towards foreigners have contributed to its immense increase in tourism. However, one needs to possess proper documents before they can plan a trip to visit the world’s fastest growing economic country. Apparently, many people confuse a visa with a Passport. It is therefore important to know that they are two different things. A Passport works as an identification card, and it is issued by one’s country allowing them to travel internationally. A visa, on the other hand, is an endorsement that exists within the Passport. The Chinese visa grants official permission to the holder to enter a country for a limited duration. It’s important to understand the basic China visa requirements before applying. The law of possessing a visa in order to enter a specific country varies from a Country to another depending on their regulations. It also depends on which Country a person belongs to. Example, an Indian passport allows the holder to travel to countries such as Indonesia, Bhutan, Mauritius, Maldives, etc. However, only a limited time period of 15 days is acceptable for these Country’s citizens as well. If a person of those Countries wishes to stay for more than 15 days, they too have to posses visa in order to enter China. What Type Of Visa Do I need To Go To China? For a person planning to apply for a China visa, it is important to know what type of visa they should apply for. There are altogether 12 different types of Chinese visas that a person can apply for, depending on what their purpose for a visit is and how long they intend to stay in China. Tourist Visa (L)This type of visa is for sight-seeing and touring purpose. The duration of the stay can range from 30-60 days. Business Visa (M)As the name suggests, this type of visa is for people visiting China for trading and Commercial purpose. The duration of stay is usually 30-60 days. Non-Commerce Visa (F) Before M visa came along, F visa was used for business purposes. 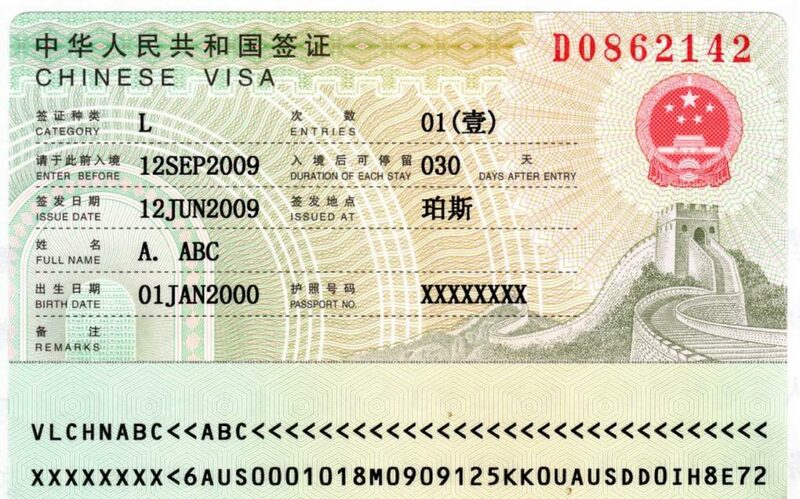 However, at present, the F visa is for people visiting China for research, scientific or study tour purposes. The duration of stay can be from 30-90 days. Work Visa (Z)The Z visa is for those non-Chinese citizens who are employed in China. It is a single-entry type visa. It can also be applied to people conducting/ owning business establishments in China. Study Visa (X1/X2)Study visa is for students who have been admitted to Chinese institutions. The X1 visa is for students who intend to stay in China for more than six months. Whereas, the X2 visa is for those students who have to stay for less than 6 months. Private visa (S1)The private visa is issued for those people who intend to shift to China to live with his/her immediate family members studying or working in China. Original proof of kinship is usually mandatory for such visas. Private Visa (S2)The S2 visa is similar to the s1 visa system. It is applied by those people who intend to visit their family members studying, working or living in China. Proof of Kinship will also be required in this case, similar to S1 visa as well. Long Term Family Visa (Q1)The Q1 visa is issued for those people who have Chinese origins or Chinese Descendants or are the spouse of a Chinese citizen. The duration of the stay can exceed 180 days. Kinship proof is required for Q1 visa. Short Term Family Visa (Q2)Similar to the Q1 visa, the Q2 visa is issued for people intending to visit families or are a direct Chinese Descendant. The duration of the stay is only limited to 120 days, and it is a multiple-entry visa type as well. Crew Visa (C)Crew visa is for crew members (airlines, ships, trains, etc.) of foreign citizenship. It can also be issued for family members of the crew members as well. Group VisaGroup visa is for people travelling in groups (at least 5) usually for touring purposes. In addition to the Group visa, an official visa Notification will also be required. Transit Visa A transit visa is the same as that of tourist visa. What Kind Of Adapter Do I need For China?